The Clic O23 earrings by Clic have the shape of small square blocks. Powerful and strikingly simple, with an intense blue colour. Minimalistic and subtle, bold and feminine at the same time. Also available in blue but also in purple, black, and red. Radiate simple elegance with these beautiful cubic earrings! A treat for yourself, a perfect gift for a friend. Schaars’ personal motto is ‘enjoy life and create beautiful designs!’. From this motto, she draws her motivation for the design of new creative bracelets, earrings, necklaces, and for improving her existing designs. 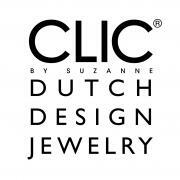 The inspirations for her Clic by Suzanne come from all sorts of (surprising) places. Actually, she hits upon the best ideas at moments when she is not working. As is the case with the Clic O23 earrings. Clic earrings are available in different geometric shapes. 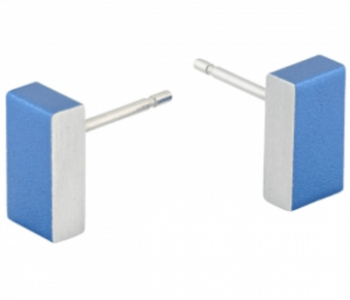 In addition to these ear studs, we also offer creoles, round, or oval-shaped earrings. Why not buy these aluminium earrings in combination with one of the bracelets or necklaces by Clic by Suzanne to complete your geometric jewellery collection!